After our rock concert sunrise and our Funny Bread breakfast we packed our daypacks for a hike through Haleakala Crater. Before we would get to the beginning of the hike though we had to park our car and hitch a ride to the top of the crater. One would think that when you are on a road that ends in several miles at a mountain summit in a National Park that it would be easy to find a ride. I, though, have a mustache and shorts that are no more than 9-inches in length. We got a ride, but not after being passed by nearly a dozen other cars. I will also have you know that the guy who gave us a ride proceeded to pass a car on a double yellow and was smoking marijuana on the drive up. We were quite happy when we reached the summit and could hop out, although that we weren’t still standing several thousand feet below. The beginning of the trail is known as Sliding Sands and takes about 3-miles to take you from the top of the crater to the bottom. A 5-foot tall bar used to tether horses marks the bottom of the crater, it was at this moment that we realized we had traveled in the wrong way. Descending atop horses was clearly the most ideal way to descend, but I suppose we can’t have it all. After getting to the bottom we hiked across pumice and brightly colored volcanic ash to the Silversword Loop. 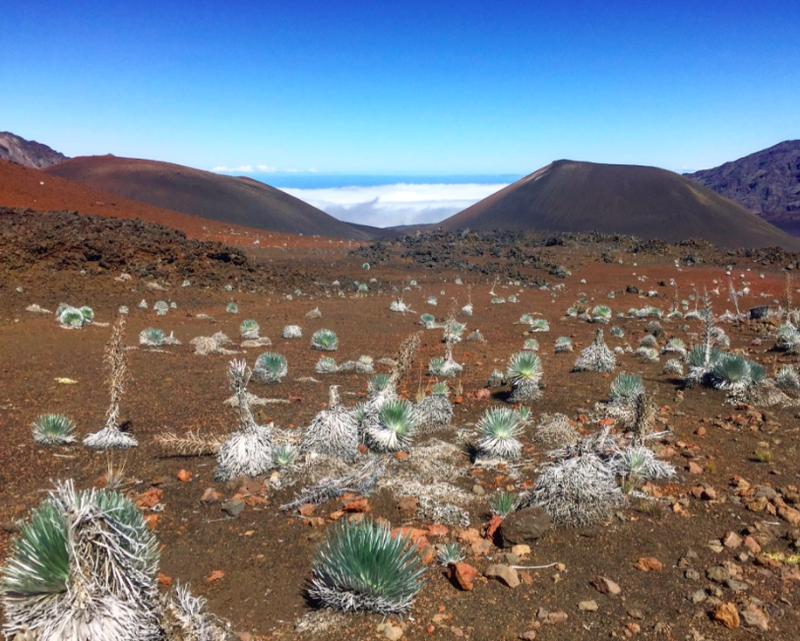 Silverswords are some brilliant Hawaiian cactus/yucca plants that bloom once in their 50-60 year lifetime releasing 50,000 seeds. They are a sea foam green/silver color and look like slightly hairy yucca. The weren’t all over the crater, but usually came in patches and often caused us to bring pause to observe their beauty. Slightly after the Silversword Loop we began descending a bit further into a slightly more vegetated part of the crater. Previously the crater was mostly dead, outside of the occasional Silversword it was mostly pumice and ash. As we moved into a place with ferns and small shrubs we came across one of the cabins that you can rent out and sleep in. Generally, they are rented out months in advance, so plan ahead if you want to use one. We sat there for some water and snacks. It was then that we saw the Ne Ne! A Ne Ne is an endangered Hawaiian goose. Years ago some Canadian Geese were blown off course and landed on the islands. Over time they stopped flying, adapted less webbing on their feet to walk on lava and became the Ne Ne. Unfortunately, due to feral cats and mongoose they lose many of their young to predation. At our spot though we saw what we thought was a pair of Ne Ne walking around. Upon closer inspection we realized that there seemed to be a little puffball following each of the Ne Ne. They were babies!! Two Ne Ne Babies! Pronounced: Ne Ne Bay Bay. We watched the Ne Ne for as long as possible before realizing that we should probably finish our hike and head back to the campsite for dinner. We had been told that the last two miles of the hike were the most difficult. It was the part of the hike known as the switchbacks. It was a series of zig-zagging switchbacks that went back and forth up the mountain. The slope was ideal and never really strenuous and we were consistently rewarded with more and more magnificent views below us. We were above the clouds and could see where they met with the crater. We could see the cabin and surrounding land. We could see the vegetated part of the crater and the where it transitioned to pumice and ash. The daytime moon was out and we traversed ridgeline that gave us a view of the clouds to our left and the crater to our right. It may have been the two most difficult miles of the trip, it was also the two most beautiful.